Life is so complicated. People are complicated. Our circumstances can get really complicated. Our emotions are a whole new level of complicatedness. With all of that being said, it is the combination of all of these complications that can lead us down a sad road to sin if we are not careful and on guard. The enemy takes our complications and begins to weave strings of depression, insecurity and doubt through them that provides a web of deception. We are all subject to Satan’s ploys; he targets us and knows just where to hit us the hardest. It is because of this snake we must be committed to the study of God’s Word, the discipline of prayer, and the ministry of the gospel message. This level of true and authentic commitment helps shield us from his attacks. 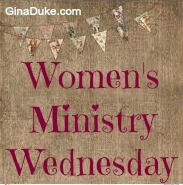 BUT, when for whatever reason, we still fail, let there be a circle of godly women to help steer us back to God. In my last post, “Fool-Proof Strategies for Issuing a Rebuke”, I shared that there was a time in my life when I was given to rebellion, where my circle of mentors were sending me rebukes in a series of letters. They would not have been able to get me to sit down with them during that time because I was bent on doing what I wanted to do, and did not feel as if I needed anyone’s input. However, as women’s ministry leaders, we need to attempt to have a sit-down with women whom are headed in a direction opposite of the obedient life in Christ, as we become aware of such situations. This is definitely not the most pleasant aspect of our ministry, but it is an important part. If you are like me, hopefully, it is a rare thing to have to do this. As such, it is understandable that we may get a little rusty at it. Every time I finish up a session, in retrospect, I always think about what I should have done differently to prepare. So, I’ve decided that I am going to outline a plan to refer back to, and hopefully, you will file it away, too, for later use. Prayer. It is a given, but I want to focus on praying for her heart. I pray that she will be open to hearing truth and loving, faithful counsel. I pray that my heart will be right, too. I pray that I will not be distracted by her story. I pray that I can be empathetic, but not to the point of condoning her sin, no matter her complicated circumstance. Scripture Reading. Depending on what area of sin we are dealing with, I am going to read God’s Word to make sure that I am sound and clear in thoughts and counsel. I believe God will speak to me through His Word and give me words of wisdom to impart. Selecting godly women. Sometimes we will meet one-on-one, and sometimes a group of us may meet. Having spiritually mature women with similar backgrounds or exposure to her current circumstance or area of sin will be a plus. If I am sitting here with a perceived or actual happy life trying to tell another woman who is going through something traumatic that she just needs to do the biblical thing, it may come across as disingenuous or naïve. 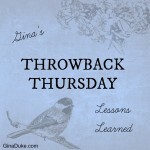 But, if we are a group of women sharing our past hurts, stories of how God sustained us or how we regret not making godly decisions in our past, then we have a better opportunity to get through. All Scripture is inspired by God and profitable for teaching, for reproof, for correction, for training in righteousness; so that the man of God may be adequate, equipped for every good work. 2 Timothy 3:16-17. I may change the scripture depending on the circumstance. Here are some alternative scriptures to consider reading aloud. 2. Clear the mind. Next, I will have prayer. In this prayer, I am going to ask God’s Holy Spirit to minister to this woman’s heart. I am not going to over-do the prayer because I do not want it to be a turn-off to this woman. I want it to be simple, yet, powerful. By doing these first two things, I am setting the stage for the context of this discussion. No doubt, the enemy has told her that once we hear her story, we will understand her position. But, I am going to counter that lie with a tone that instead values both the authority of God’s truth and the protection of this woman’s heart. 3. Start the discussion. Because I believe that it is so important for women to have someone to tell all of their story to, I am going to be that person. I will ask her to start from the beginning and bring us forward to where she is at today. I am going to be patient and listen to what she is saying. I am not going to interrupt. I am just going to listen, with tissues available. I may cry with her, but other than that, I am going to be silent during her story’s unfolding. 4. Seek to understand. After hearing her story, I am going to try to clarify her thoughts about decisions she has made or are planning to make by asking her some questions. I want to fully understand her thought process. In doing so, I can better determine which scriptures to share with her later in the discussion. 5. Share experiences. I think at this point it is helpful for the other women to share their similar experiences. We may tell how God sustained us or how He led us. We may share our regrets of when we ignored God’s Spirit and His Word. We may share our struggles and our victories, which will build trust. 6. Share some Light. Once I understand her perspective, I am going to open God’s Word. 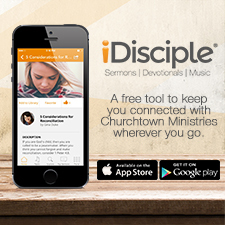 I have a great online tool to use to look-up related scriptures. Just type your topic here. Print out the scriptures for the meeting, and review them with her. 7 Bridge the gap. Afterward, we can discuss how her scenario lines up to Scripture. Hopefully, we get to a place where we can determine scenarios for her to get from point B back to point A, the center of God’s will. 8. Bring to a close. After some lengthy discussion, you will have a sense as to whether or not you are making progress. If you are making progress, you can either continue on if time allows, or get to a good stopping place and agree to meet again very soon. 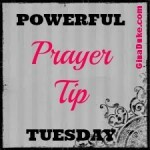 If you feel that the meeting is not progressing, then bring it to a close, trusting God to work out the rest. 9. Offer continued help. Regardless of the outcome of the session, please make yourself available to be a sounding board/accountability partner. Obviously, you will have to weigh the circumstance and person against this idea. 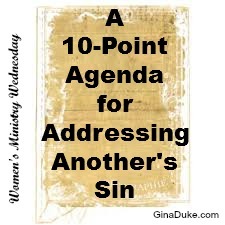 Be sure to set boundaries; some people have no shame in their sin or in their intrusiveness. Some women will take advantage of your offer to help them with groceries, time and childcare with no thought to repenting of their behavior. But in normal circumstances, if there is such a thing, most women will come back around and take up your offer of help in good faith. 10. End on a godly note. Honestly, you may not get to a “good” note with this person. It may not end well. It may end worse than you anticipated. You may not even have a good sense if she is repentant or not. But, then there may be times, it does end well – glory to God! Regardless, end in prayer and hugs. If there is still disagreement, reassure this woman that she is loved by the group and by God. I hope this agenda will help you in your next meeting, and hopefully, you won’t need it for a while. Wouldn’t it be wonderful if we all could stay free from sin and in the will of God? Oh yes, that is my heart’s desire. Let it be, Lord, let it be! I would also love to hear some of your tips, practices and words of wisdom for addressing such sensitive issues. Author Gina Duke is a wife, mother and Director of Women’s Ministry at her local church. Gina is also a speaker with a B.S. in Organizational Leadership. She is able to bring a clear word for authentic Christian living. Through her book, “Organizing Your Prayer Closet: A New and Life-Changing Way to Pray” (Abingdon Press), she imparts 1 Peter 4:7 with the gift of structured prayer journaling. Ms. Duke also blogs and offers numerous videos and resources at GinaDuke.com. You may also follow her on Twitter and Instagram @TheGinaDuke.